I have to confess that the initial reason this book caught my attention was that gorgeous, absolutely stunning cover. It is even more beautiful when you are holding it in your hands. Love it! When I read the premise for this book, it sounded right up my alley. I love dark and menacing novels. However, this book didn't quite live up to my expectations, BUT in the end I did like it! The main thing that was preventing me to love this book more was the length. I am not against longer novels at all, as long as the story line backs it up. 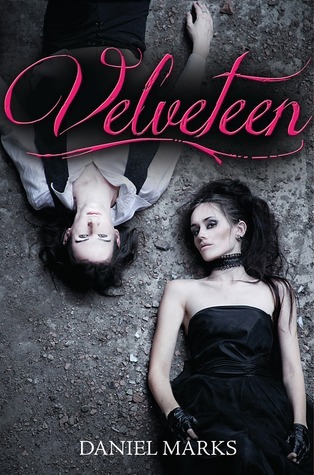 With Velveteen I found that it could have been at least 100 pages less. There was some unnecessary details that carried on and on. I found that the storyline would get sidetracked with those minor details that just ended up taking to much time. When the story did pick up, boy was it a page-turner! There were bursts of moments in this book where I lost track of time completely! I loved the main character, Velvet. She was exactly how I imagined she would be. The author definitely did a wonderful job at penning Velvet! Even though this book had a few minor traits that briefly took away from the reading experience, I enjoyed the book overall! It was mysterious, page-turning, and definitely dark! A great read to curl up to by the fire during these colder months!! Thanks for your honesty. Lovely review! Definitely agree about the length-there were definitely some parts that felt unnecessary although as a whole I was pretty happy with the book!